"You've never experienced a novel like this. 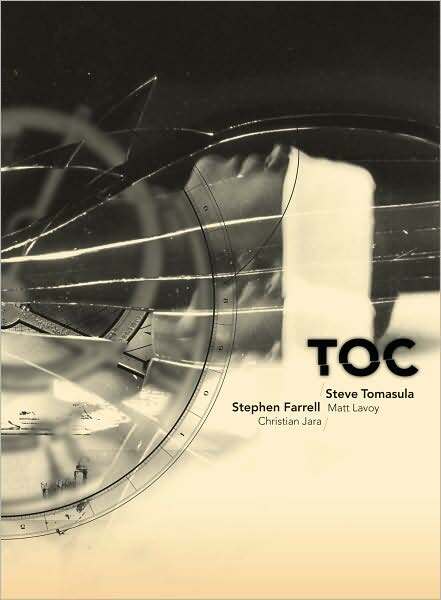 TOC is a multimedia epic about time—the invention of the second, the beating of a heart, the story of humans connecting through time to each other and to the world. An evocative fairy tale with a steampunk heart, TOC is a breath-taking visual novel, an assemblage of text, film, music, photography, the spoken word, animation, and painting. It is the story of a man who digs a hole so deep he can hear the past, a woman who climbs a ladder so high she can see the future, as well as others trapped in the clockless, timeless time of a surgery waiting room: God's time. Theirs is an imagined history of people who are fixed in the past, those who have no word for the future, and those who live out their days oblivious to either. A new media hybrid, TOC re-imagines what the book is, and can be. Produced as a DVD for playback on personal computers (both Macs and PCs), TOC retains the intimate, one-on-one experience that a reader can have with a book even as it draws on the power of other art forms to immerse readers in an altogether new multimedia story." 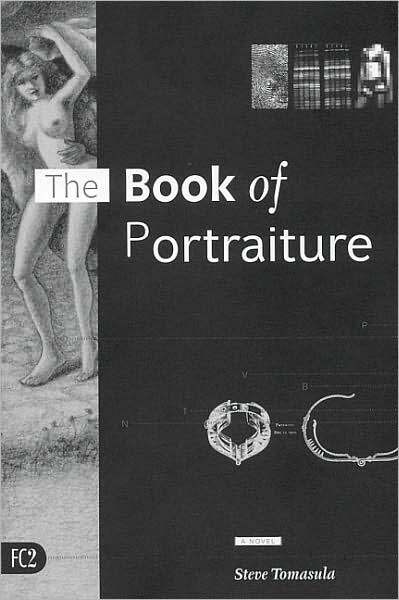 "The Book of Portraiture is a postmodern epic in writing and images. A desert nomad struggles at the close of the ancient world to inscribe himself into life, and centuries later a Renaissance artist attempts to overcome his lowly origins by painting nobility. Throughout Steve Tomasula's arresting tour de force, human beings seek to become what they are by representing it. An early twentieth-century psychoanalyst in search of a cure for sexual neurosis discovers the reflection of his own yearning in a female client, and an accidental community of twenty-first century image-makers connects the pixels to bring their group portrait into focus." Across a canvas that spans centuries, the several narrators of this novel look through the lens of their own time and portray objects of desire in paint, dreams, photography, electronic data, and genetic code. Together their portraits comprise a collage of styles and habits of mind. The Book of Portraiture is a novel about the irrepressible impulse to picture ourselves, and how, through this picturing, we continually re-create what it means to be human." “[E]very portrait tells more of its creator than its subject; every portrait is and can only be a self-portrait ...” - The Book of PortraitureSteve Tomasula’s The Book of Portraiture is an intricate collage of desires, perceptions, and creations, reflective constructions of the hungers that make us human. Comprising five chapters that span from the birth of the phonetic alphabet to that of genetic engineering as an art form, the novel investigates the evolving nature of the act of representation. Tomasula’s multifaceted mélange urges us to ask: Why do we have the need to recreate ourselves in images? And how do these images identify us? Tomasula slides smoothly from one setting to the next, shifting with ease from the voice of a desert nomad to that of a 17th century painter, then swiftly transforming into an early 20th century psychoanalyst, and so forth. The breaks between sections of the novel are sharp and abrupt, but Tomasula morphs from character to character, across countries and centuries, without missing a beat, always retaining his distinctive splashes of humor and perceptive irony. The chapters, though starkly discrete, coalesce in their collective purpose—to provide diverse commentary on the role of portraiture, in all its forms, and the conflicts our creations may cause us. The novel begins with the desert nomad’s tale. Portraiture in this chapter takes the form of written language, as the nomad designs the first phonetic alphabet—and in doing so establishes writing as an art form. For the first time, individual sounds translate to individual symbols; for the first time, the word “I” is written. And with that “I” follows the first written creation of an alter-ego: the nomad invents a personality for his fictional autobiography, renaming himself Moses and stealing a story he heard about a baby found floating in a basket on the Tigris. The nomad’s illusive account introduces representation as a means of reinventing identity—one of many themes interlacing the novel’s separate parts. The novel continues with the sketchbook of 17th century Spanish painter Diego de Velazquez, who examines human perceptions in painting and the ways artists’ desires filter through their portraits. Velazquez fervently reshapes his theories on the mission of the artist, filling his sketchbook with musings like, “It is only by paying strictest attention to the techniques of representation that we can discover a subject grander than representation.” As an example, he exalts Michelangelo’s Sistine Ceiling as the transformation of human form into emotion. But in Velazquez’s quest to achieve similar effects in his own work, he begins modifying biblical scenes in order to express the figures’ invisible qualities—such as adding a smile to Moses’s face to depict the “pleasure” he imagines the prophet felt at receiving the Law. Velazquez’s habit of alteration results in a confrontation with the Inquisition, forcing him to defend—to a society in which the Church rules all—the supremacy of the bond between the artist’s vision and viewers’ perceptions. The novel’s third section traces the longings of a psychoanalyst during the early 20th century. Intrigued by a young woman who begins attending sessions with him, the psychoanalyst unwittingly projects his own secret desires, his own sexual conflicts and obsessions, onto the dreams his client recounts. This form of portraiture, the reshaping of another person’s dreams into mirrors of one’s own yearnings, explores the molding of human desire at a subconscious level. This apparent contradiction poses one of the novel’s most perplexing questions: Can the process of re-creation occur without the awareness of the creator, the “artist” himself? The next chapter involves the stories of nine present-day characters: a computer programmer, a model, a digital photograph retoucher, a video-graphic designer, an army veteran who now works as an employee profiler, an investigator, a pharmacy manager, a pharmacy technician, and a pharmacy cashier. The characters observe each other through camera lenses, hidden surveillance videos, and computer screens, capturing the human form digitally, then reconstructing it—cutting and pasting—sometimes to the extent that the original model can barely recognize the new, “digitally manipulated” images of herself. In U_’s case, “With someone else manipulating her shape, her face, her art, it was as if her ability to use her body was being stripped from her”. Through the digital medium, Tomasula questions artists’ abilities to reinvent a subject’s identity against his or her will. In the final section of the novel, Tomasula pictures the technological possibilities of the future. In this setting, human representation may begin at the genetic level, where it’s possible to create the human form by literally, physically, creating a human form. With an egg cell, a sperm cell, and some extra DNA, Mary and Paul endeavor to produce a masterpiece entitled “Self Portrait(s)”—the fertilized egg, the supreme self-portrait. Of course, the religious ethicality of the situation is brought into question, and Tomasula returns to the issue of an artist’s capacity to reshape a subject without the subject’s consent. Paul discovers that Mary has a secret collection of sperm—from all the men she’s slept with throughout her life—which she’s maintained for years without the men’s knowledge. Yet to Paul’s complaints Mary responds, “It’s not exactly like you guys were so concerned about what happened to your sperm when you came over here.” In other words, if these men willingly gave her their sperm, can she not use the sperm any way she likes—to remold the human form as she desires? 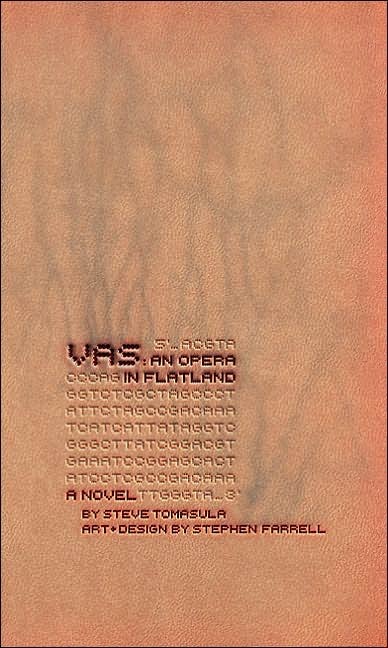 "Printed in the colors of flesh and blood, VAS: An Opera in Flatland—a hybrid image-text novel—demonstrates how differing ways of imagining the body generate diverse stories of history, gender, politics, and, ultimately, the literature of who we are. A constantly surprising, VAS combines a variety of voices, from journalism and libretto to poem and comic book. Often these voices meet in counterpoint, and the meaning of the narrative emerges from their juxtapositions, harmonies, or discords. Utilizing a wide and historical sweep of representations of the body—from pedigree charts to genetic sequences—VAS is, finally, the story of finding one's identity within the double helix of language and lineage." "More than a novel with 3-color graphics, almost a film, possibly a meditation, certainly "a breathtaking inquiry into the artifacts of the human imagination, VAS is sensuous, ferocious, and original" (Rikki Ducornet). When Flatland inhabitants choose to rearrange bodies (animals, plants, even themselves), they enter the double-helix of language and lineage—stories of knowledge, power, history, gender, politics, and self-identity." 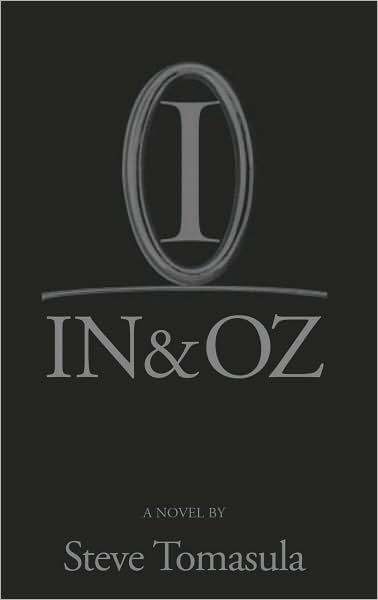 "IN & OZ is a novel of art, love, auto mechanics, and two places: the actualities of the here and now and the desire for somewhere better. Five men and women - an auto designer, photographer, musical composer, poet/sculptor and mechanic - find themselves drawn together when they begin to suspect that the thing lacking in their lives might be discovered in the other place. Against the tension between idiosyncratic art and mass-marketed taste, each works to bridge the gulf between IN & OZ by using the medium of their trades: light and darkness; sound and silence. IN & OZ is a story as old as the Tower of Babel and as new as global markets: the story of people trying to reach beyond the limits of language and remake the world, or at least their selves." "IN & OZ is a novel of Art, Love, Auto Mechanics and two places: the here-and-now and somewhere better. Five men and women—an auto designer, photographer, musical composer, poet/sculptor and mechanic—find themselves drawn together when they begin to suspect that the thing lacking in their lives might be discovered in the other place. Theirs is a Beckett-like world of drive-up windows and factories rather than sidewalk cafes: a world where the idiosyncratic is in tension with the mass marketed be it in music, automobiles, or thought. When Mechanic realizes one day that he has always been a cog in the machinery of IN & OZ, he is set off on a journey of self-discovery. His struggle to escape a destiny preordained by his past has broad implications for anyone who has ever found themselves trying to be free within the constraints of their job, their class, but especially within a cultural moment much like our own….